Download "What to Know About State CPA Reciprocity Rules. 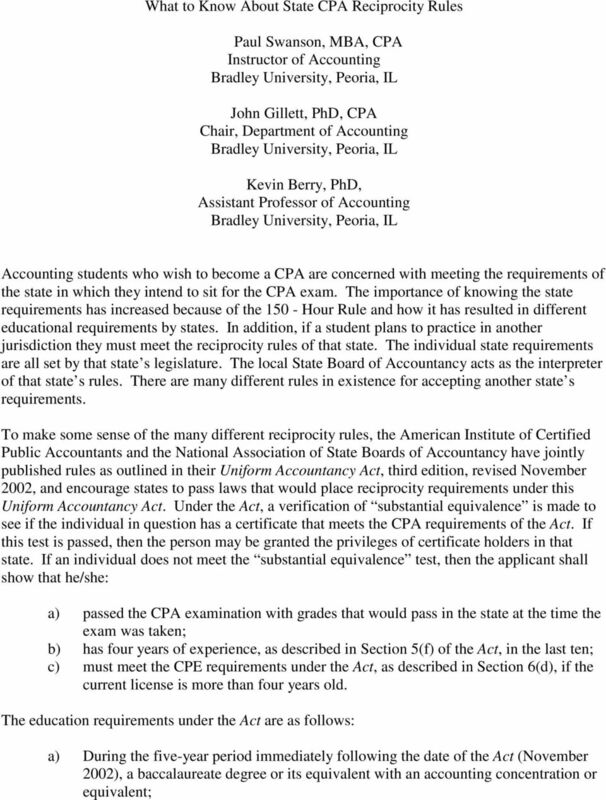 John Gillett, PhD, CPA Chair, Department of Accounting Bradley University, Peoria, IL"
2 b) After the five-year period, at least 150 semester hours of college credit including at least a baccalaureate degree with an accounting concentration or equivalent. The adoption of these rules is up to the individual state legislatures and it could therefore be a long time before being accepted by a particular state. To provide some guidance, Table 1 summarizes the current reciprocity rules. The information in the table was obtained from the following sources: State Boards of Accountancy web sites, State Statutes and Rules; and direct contact with Board of Accountancy personnel. Table 1 is designed to reflect the major rules regarding reciprocity. Each state is identified and an is marked in the columns of the reciprocity rules that it requires. If work experience is indicated as an avenue to gain a license, the number of years required is indicated. When this experience is required in the last ten years this is also indicated. For example, Alaska requires five years of accounting experience in the last ten (5/10). It is also important to note that: A few of the states have reciprocal agreements with other states. This information is not contained in the table but may be obtained by contacting the local State Board of Accountancy. Where experience is mentioned as a requirement, it is meant that the experience is in accounting. Many states have very specific types of experience. That information must be obtained by contacting the local State Board of Accountancy. Changes are being made on an ongoing basis, and some state laws allow for the Board to have discretion. 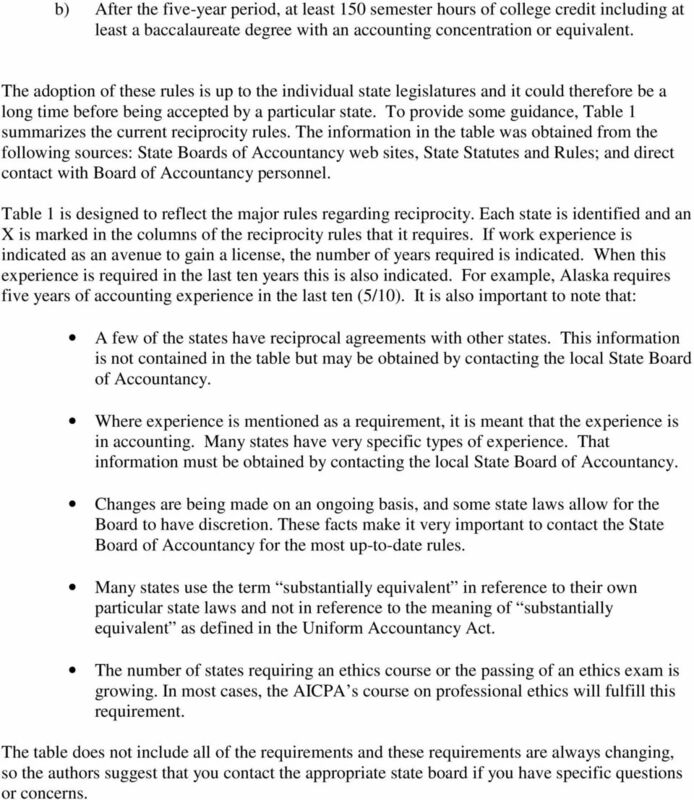 These facts make it very important to contact the State Board of Accountancy for the most up-to-date rules. 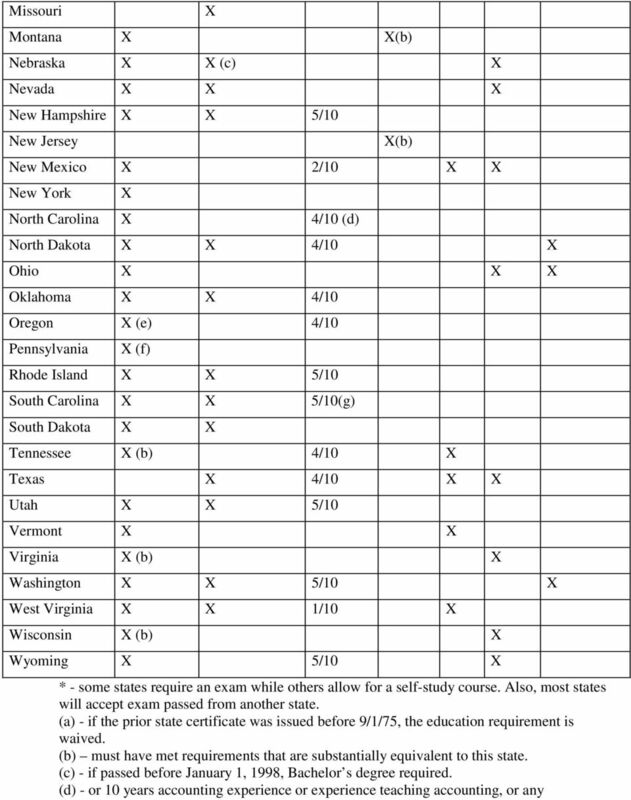 Many states use the term substantially equivalent in reference to their own particular state laws and not in reference to the meaning of substantially equivalent as defined in the Uniform Accountancy Act. The number of states requiring an ethics course or the passing of an ethics exam is growing. In most cases, the AICPA s course on professional ethics will fulfill this requirement. 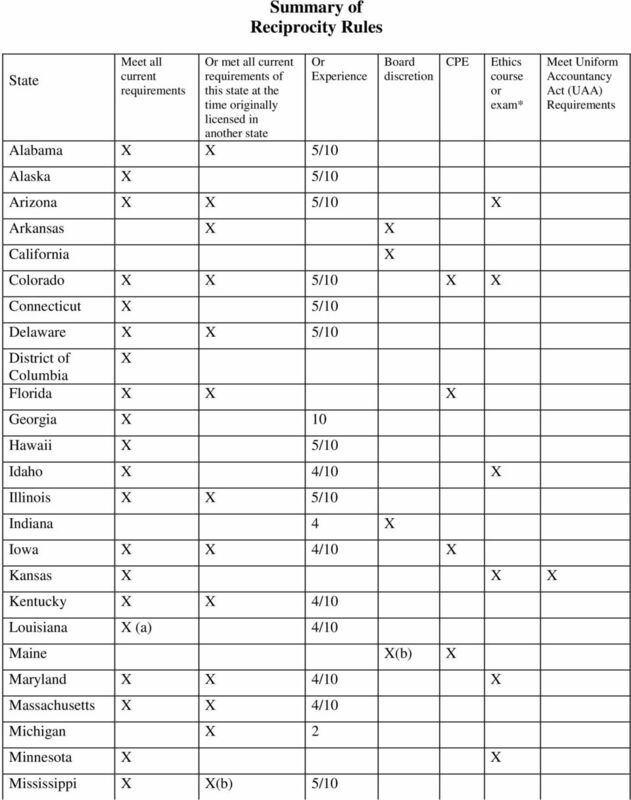 The table does not include all of the requirements and these requirements are always changing, so the authors suggest that you contact the appropriate state board if you have specific questions or concerns. 5 combination of such in the past 12 years, and 80 hours of CPE if previous license is 4 years or older. (e) before January 1, 2000, 2 years experience. After January 1, 2000, 150 hours plus 1 year if experience. (f) or held a license in another state for the previous 5 years. (g) - 3 years of public accounting experience required. Is the Uniform Certified Public Accounting Exam Uniform?